Date of 2013 London-Brighton Commercial Run ? : On May 5th. 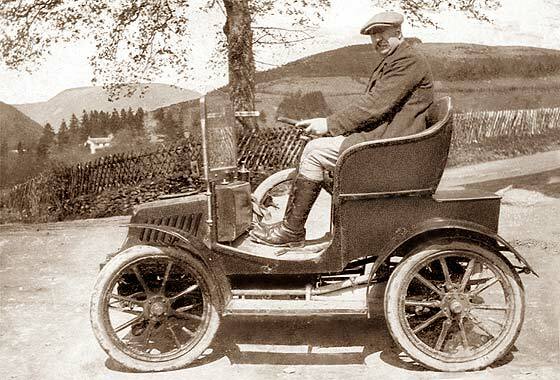 Brief email and photograph received from Simon Prentis (UK) saying " I have recently discovered this photo of my great-grandfather, Thomas Steadman, proudly sitting in his car -- clearly a working vehicle -- on his farm in Wales in (I think) 1907. If able to identify it, any idea what it might have been worth at the time? 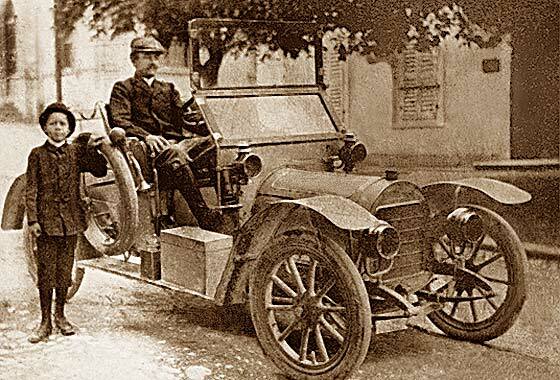 -- Our VCC veteran expert advises: sloping side bonnet louvres, 8-spoke front 10 spoke rears, shaft drive, French cca 1903 Peugeot 5hp type 54 voiturette. Friswell London: £195. 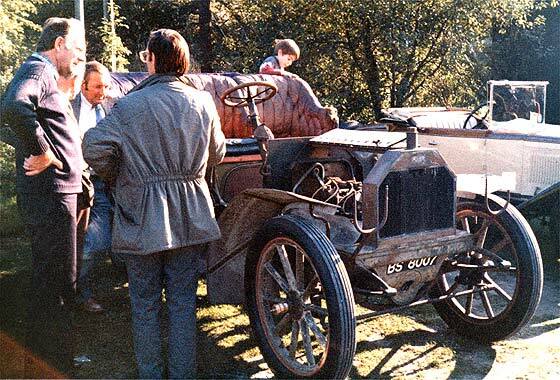 Interesting photos received from Patrick Laycock (UK) who has been going through his Grandfather's photos of cars which the Montagu museum have had trouble identifying. Taken in 1909/10. -- Reg number is Wolverhampton CBC. Our 'Star' expert immediately recognised it as a cca 1904 Little Star 7 HP Two-Seater as manufactured by the Star Motor Company of Wolverhampton. Star made some lovely cars, became Guy Motors in 1928 but closed 1932. The front round gizmo is the mag timer. Interesting photo received from our Publicity Officer Tony Russell (UK), who found this piccy in one of his old albums, taken at least 30 years ago at a rally somewhere. Can I identify it? -- Not immediately obvious from the radiator but had a good starting point of having a Napier-like rad filler. 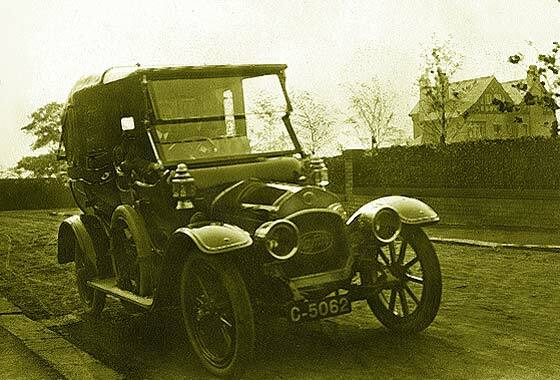 Further investigation advises it was an early cca 1904 Napier of America 12HP Side Entrance Tonneau. Car was assembled in Boston USA. Registration is 'age related' Orkney Islands, and is still in use. Photo from Eric Clarkson, Bantry, (Ireland) which was taken by his uncle in Cape Town, South Africa in 1905, who was a Benz dealer in London. 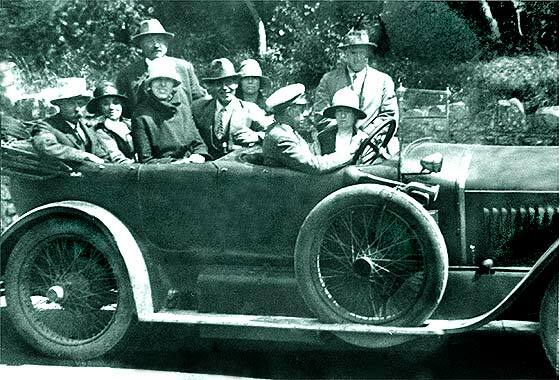 It may have been first car to overland from Johannesberg to Cape Town. His companion on the journey was a Mr. Patterson, perhaps owner of the car. Registration seems ..8412 possibly London? -- Regret not a Benz and doubt London reg. Hence unlikely to be able trace name of original owner. 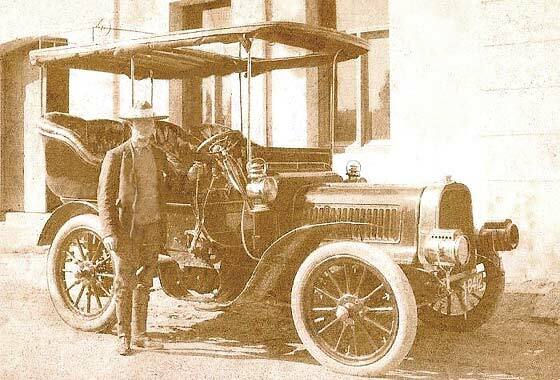 Car is an American cca 1905 Pope Toledo RE Tonneau. Another from a batch of fascinating photographs from our regular contributor Cicos Florin in Constanta by the Black Sea (Romania) who is interested in old cars of Romania. Do we know what this is? -- Louvre pattern with differing angles for each louvre, the rectangular rounded rad with a bar in front, with staring handle below the bar, and the handle going through the core, all suggest a French cca 1905 Charron, Girardot & Voigt (CGV) 15 HP Roadster. Racing car?, possibly made in the USA . 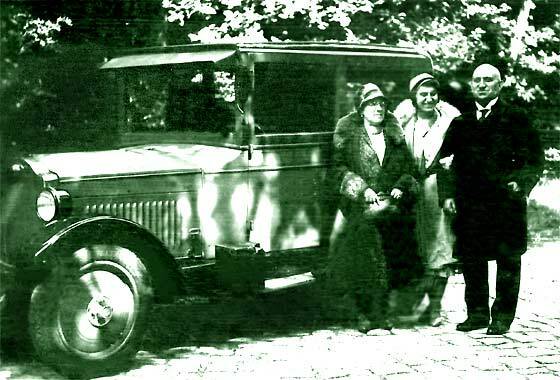 Another puzzling photo received from Numaweb site (Switzerland) with a request for the identification of the car. No further background on the picture was provided. -- Photo was a little damaged so we have repaired it. After detailed study and from the radiator we are relatively certain this is a French car made in Poissy near Paris by Automobiles Gregoire. Largish bonnet so is a cca 1906 Gregoire 12'14 Runabout. AG started making cars in 1904, made about 500, and closed down in 1924. Cinema screen grab from a Yugoslav co-production film "Assassination in Sarajevo " made in 1975 where the cars are being investigated by IMCDB. The film is about the assassination of Franz Ferdinand and start of WW1. -- Not a country noted for interest in old cars so all are wrong. 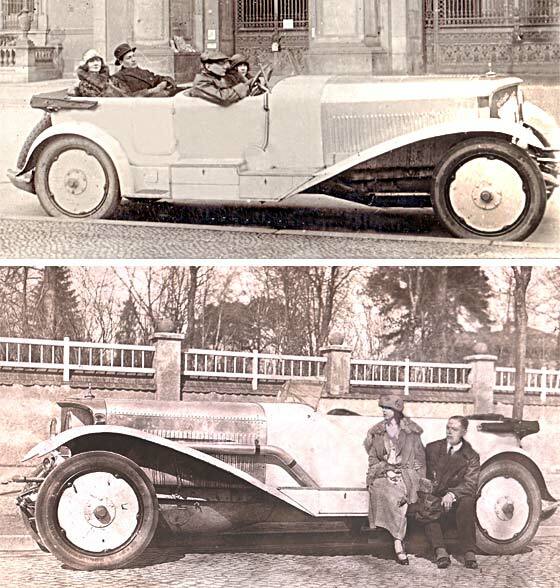 This one was a puzzle as had curved profile radiator like a Charron but much wider bonnet, until Ariejan Boss pointed out that Praga made Charron under licence; so this is cca 1907 PAT (Praga) Charron Phaeton. Interesting photos received from Patrick Laycock (UK) who has been going through his Grandfather's photos of cars which the Montagu museum have had trouble identifying. Taken in 1909/10. -- Registration number U 1443 is Leeds County Council. From the short bonnet and the very large wheel hubs this seems to be a Wolseley from the' Wolseley Siddeley' period, being a cca 1910 Wolseley 12'16. Latest scuttle shape, the body would seem to be a two seater, possibly the 'Light Two Seater'. 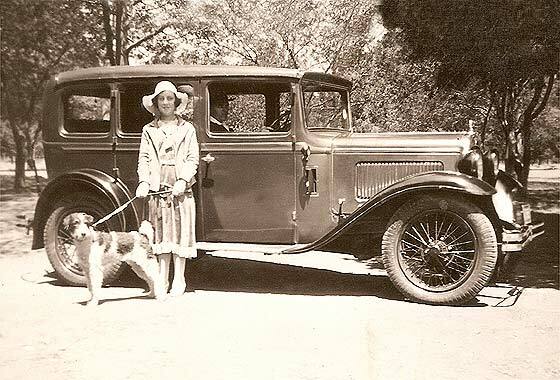 Interesting photos received from Patrick Laycock (UK) who has been going through his Grandfather's photos of cars which the Montagu museum have had trouble identifying. Taken in 1909/10. -- This was manufactured in Aachen in Germany. The registration C 5062 is West Riding of Yorkshire, whose dating data is lost, but 1910 is about right. This is a cca 1910 Fafnir Open Drive Landaulette. 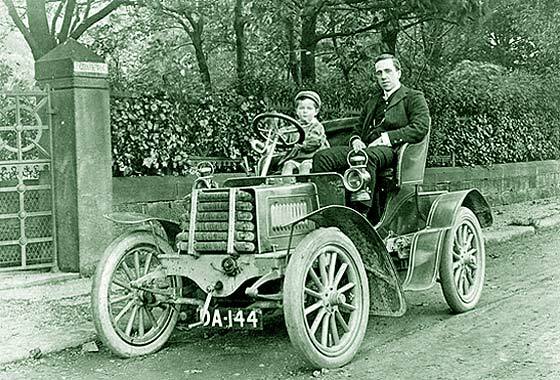 Big car so probably the 16HP model available 1910 from northern agents, basic form, for £275. 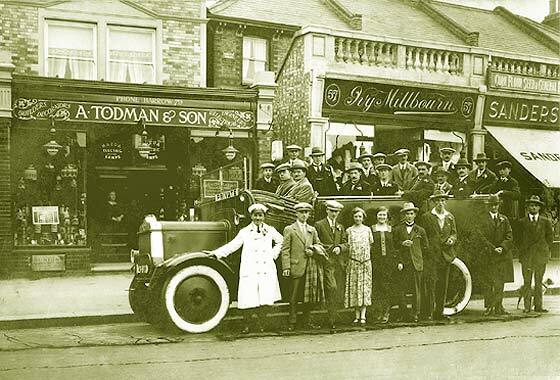 Photo received from Roger Butlin, Pinner (UK), who heard of us through Family Tree Magazine, of a "works" outing just prior to departure in front of Todman's shop at 57a High Street Wealdstone with staff and family members including his mother. About 1926 and has 'National' on side. 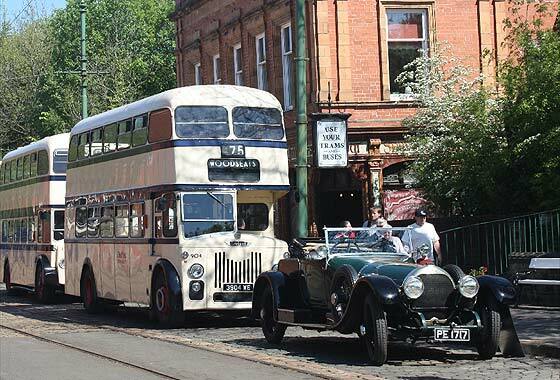 -- Latest: Mike Sutcliffe advises it is a heavily rebuilt AEC B Type, new originally in 1912 as LGOC B1801, a double decker. Here as National Omnibus & Road Trans Co (no.2139), rebodied cca 1921 as a charabanc. 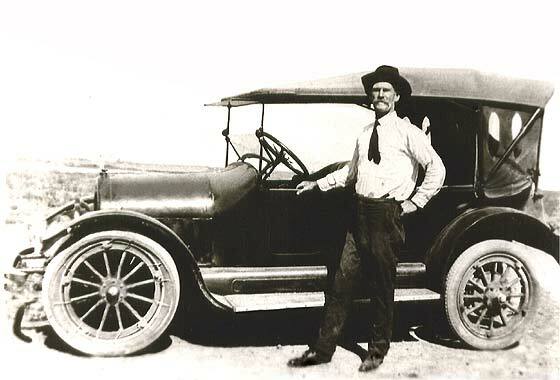 Interesting photo received from Mark & Jenifer Brigham (USA) showing his Great Grandfather with his car, most likely taken in mid west, Oklahoma. They would love to know what car he drove back in the day. -- A couple of our experts agree that this is a cca 1916 Overland Model 75 Touring. 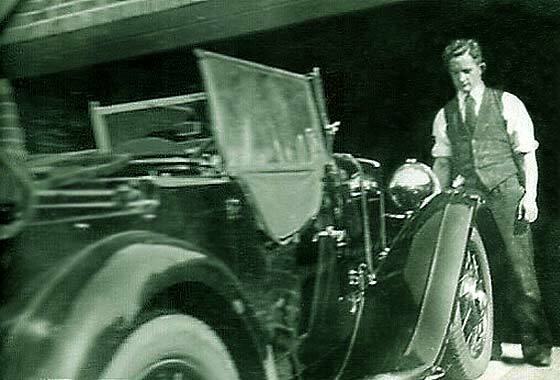 Overland started cars 1903 in Indiana. Purchased by auto dealer John Willys in 1912 became Willys-Overland and was the second largest producer of cars in USA after Ford. Last Overland made in 1926. While looking through the internet in process of identification of cars, we noticed this car on a website dealing with the genealogy of a David Trompson in USA. 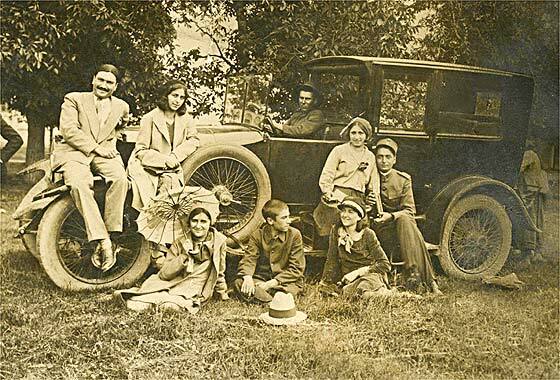 One of the photos on this site is marked 'Leonard's 1916 Buick'. -- The site seems an archive so we cannot advise the error. 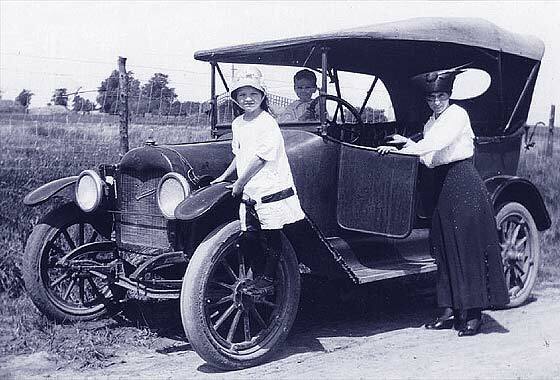 Unfortunately the car shown on the photo is not a Buick but a hooded peaked rad cca 1916 Maxwell Model 25 Touring. Maxwell started 1904 and became Chrysler. Buick started 1903 and became General Motors. Interesting photo received from Tom Robinson (Editor Sheffield Transport Study Group) (UK) who advises that a member submitted the photograph for inclusion in their magazine The Journal. Could we please identify the make of car leading this procession? -- Unique car housed in the Kelham Island Museum in Sheffield being a prototype 1920 Sheffield Simplex SSK 50hpTwo-Seater, possibly the last car made, and acquired by founder Earl Fitzwilliam in 1925 on liquidation of company. Brief email and photos received from Andrew Miller (UK) saying " I have attached a wonderful picture of my grand-father and mother with their family, c 1930, off on a special occasion. Rural Somerset, so I doubt the car is a Rolls Royce. But what is it? I've trawled through most of your help pages to no avail. Can you help please." -- Simple when one of our experts told me ! Couple of feet more of the bonnet would have shown clearly this is a cca 1922 Crossley, probably 25'30 Manchester Tourer. 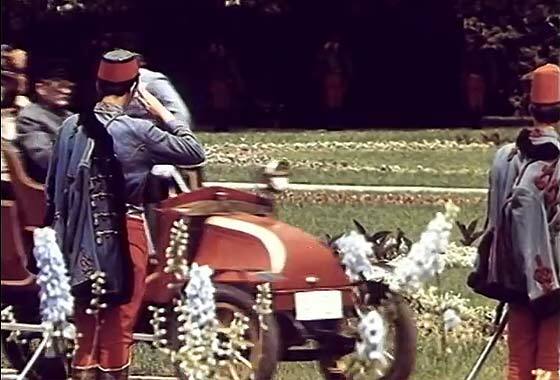 Cinema screen grab from a Yugoslav co-production film "Assassination in Sarajevo " made in 1975 where the cars are being investigated by IMCDB. The film is about the assassination of Franz Ferdinand and start of WW1. -- Not a country noted for interest in old cars so all are wrong. 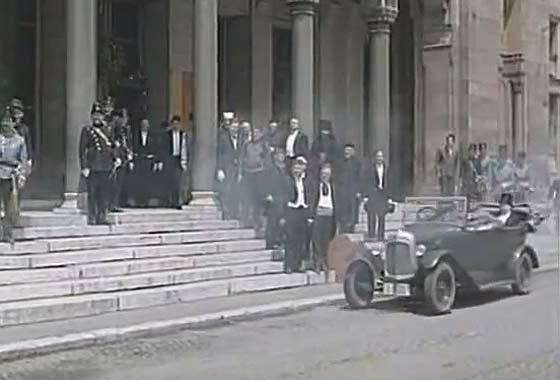 The first car in procession was a 1925 Laurin & Klement (Skoda), the Graf & Stift is also Laurin & Clement and one of the follower cars is this cca 1924 Citroen B2 Torpedo. Assassination was 10 years earlier, 1914. Another from a batch of fascinating photographs from our regular contributor Cicos Florin in Constanta by the Black Sea (Romania) who is interested in old cars of Romania. Do we know what this is? -- Almost every possible identification feature is hidden by people but despite this I spied a couple of pointers: pointed front mudguards, Teutonic smaller lights below the headlamps, and a spitzhuhler radiator just visible with a D badge, advising cca 1926 Austro Daimler ADV Open Drive Limousine. 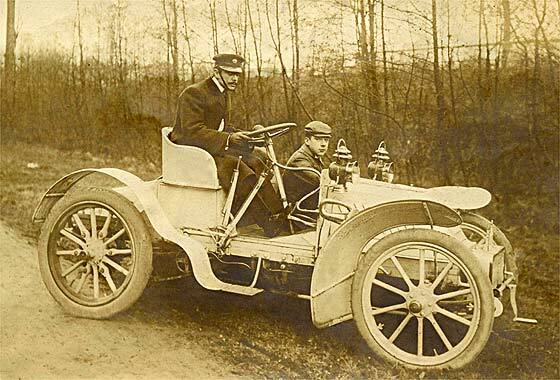 Another lovely photo received from Paul Benjamin (UK) showing his Great Grandfather with his car, most likely taken in Germany. Can we tell him the make of the vehicle.-- Made by a German company formed in 1862 to make sewing machines, then mage penny-farthing bicycles, and cars in 1899, and which in view of its success, in 1929 became a subsidiary of American General Motors. Painted rad, drum lights, no tie bar, external battery, big visor; this is a cca 1928 Opel 4'20 Limousine. Brief email and photograph received from Iain A MacRae (UK) saying "My father, Driving, did have a Morris in the Mid 30ties which was replaced by an Alvis Firefly. This is certainly not a Firefly! -- Top marks for observation. 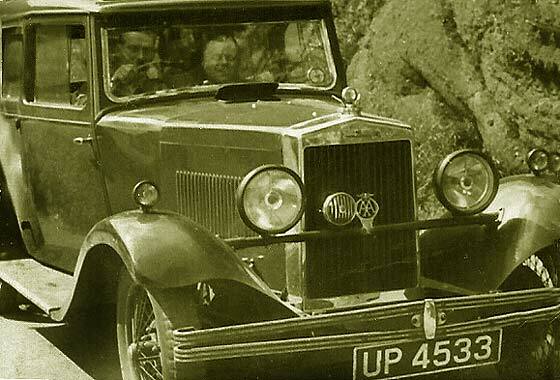 On the assumption that he had two cars, Morris and Alvis, and we agree this is not the Alvis, - gotta be the Morris! Indeed a Durham registration of mid 1930, so it is a cca 1930 Morris Oxford Six Saloon. Scroll badge indicates model range made between 1929 and '33. A couple of photos received from Andrew Stevens (UK) from a box inherited from his grandparents. This one was headed "Out for a picnic Nov 1935", which sounds rather optimistic. The woman could be his grandmother and the driver his grandfather, a driver for the Oxford Bus Co. -- Seems same dog in both, but it looks a bit younger here. The car is much earlier too. No registration is visible to help in dating the car but it is a big formal vehicle, being a cca 1930/31 Austin 20 HP Limousine. 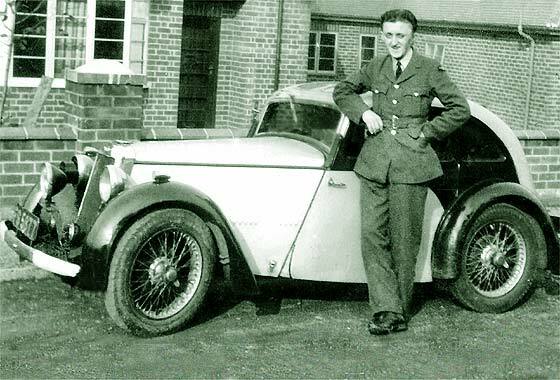 Interesting photo received from Mel Bray (UK) showing his father Jack Bray standing beside "The Bug", perhaps a Swallow SS, taken in 1939 shortly after he joined the RAF. Carried photo throughout his life. Grandfather was a village policeman. -- Registration FS 5877 was issued by Edinburgh Borough Council, 1934. The car carries a a war-time black-out mask on the offside headlamp. The car is often referred to as 'Forgotten British Sportscar'; a cca 1934 Hilman Aero Minx, £246 new. 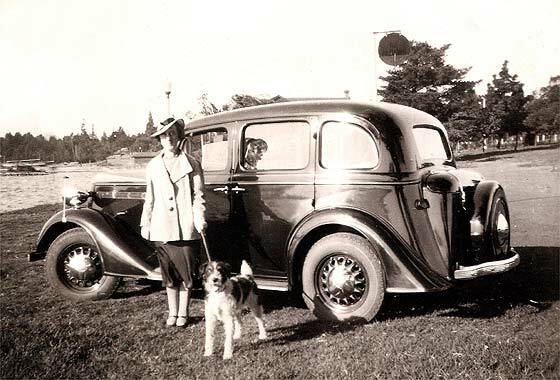 Brief email and photograph received from Iain A MacRae (UK) saying "The only other car of my fathers that I have not fully identified is again mid 30s, probably 1936. 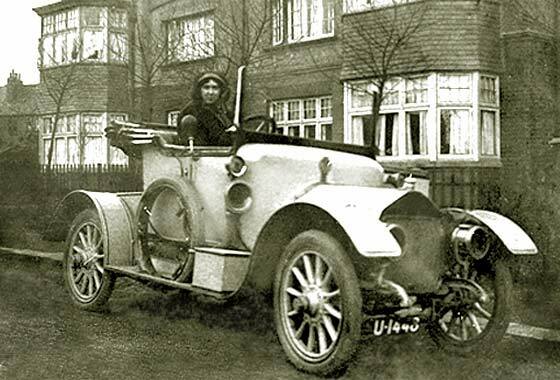 He had an MG tourer at this time, 6 cylinders were his preference. May be a Magnette or SA. -- The right number of cylinders but the wrong make. Our MG experts confirmed not an MG: bonnet has external latches, wheels have enlarged hubs and wings have a crease. However a cca 1935 Morris 10'6 Sports Tourer seem to fit bill ! A couple of photos received from Andrew Stevens (UK) from a box inherited from his grandparents. This one was unmarked so he knows nothing about it nor does he recognise the woman.-- Seems to be the same dog! No registration visible so not possible to accurately date car but as it is a Vauxhall 14'6 DX Saloon only made 1939 and 40, we can be relatively close. This model is recognisable by the rounded-off top opening extended boot, with top mounted chrome straps and catches. A cople of lovely photos received from José Ignacio Vielma Cabruja of the Architecture Department of Chile University (Chile) who is trying to identify the car to date correctly the photo taken on Caracas Expressway after 1965, probably early 70s. -- Slightly difficult for us as recent US car, especially rear view. We contacted our friends at AACA who advised that the car in front is a cca 1967 Plymouth Satelite GTX but more importantly, car coming the other way is a 1971 Dodge Dart. Another from a batch of fascinating photographs from our regular contributor Cicos Florin in Constanta by the Black Sea (Romania) who is interested in old cars of Romania. Do we know what this is? -- No, and neithe it seems does anybody else!! It was suggested that it may be a 'Special' based on a Blitzen Benz but nobody was able to confirm this. Even Nick Georgano drew a blank suggesting this is a 'bitza' with no connection between rad and chasis in the tradition of the Chitty-Chitty.. 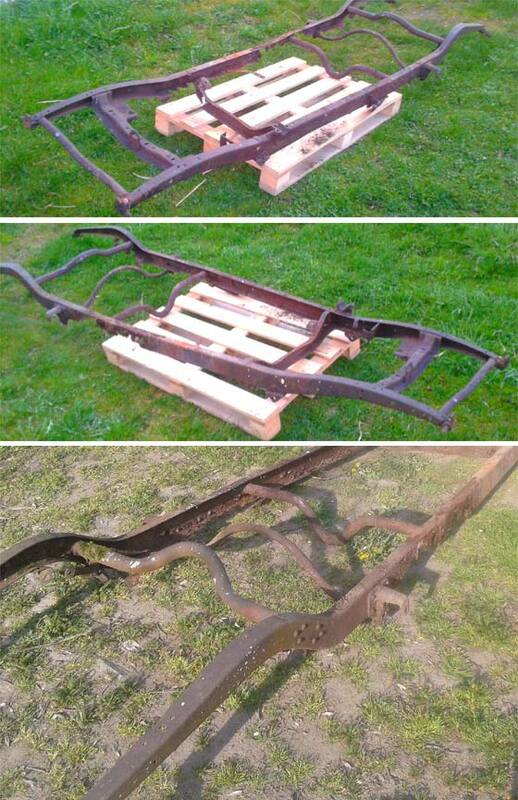 Photos received from Milan Vocílka, Museum of Motorbikes, in Horní Radoun, (Czech Republic) who would appreciate help with identification of a car chassis. They have not been able to identify it but think that it might have came from an American car. -- We regret this enquiry is a little bit too specialised for us. Our knowledge base relates mainly to the general overall veteran and vintage vehicle scene, but regretfully not always in detail. If anybody has any ideas, please email back to us. Links to interesting sites: Click on any hyperlink to be taken direct to their site. The information contained in these pages has come from many different sources including books, magazines, advertisements, sales brochures, web sites, manufacturers and personal contacts. While we have tried to make sure that any information given is as accurate as possible, we cannot take responsibility for any errors or omissions. If you know of any facts which are incorrect or any subjects or details which can be elaborated on, please contact us. No infringement of copyright is intended anywhere on the site. If such infringement is believed to be occurring, please contact us.